On the Zappiti Player 4K, when launching the ISO file playback (or BDMV), it can happen in rare cases that a bonus playback is launched instead of the movie. This occurs when the file corresponding to the bonus has a bigger size as the movie file. Indeed, for Blu-ray playback, Zappiti starts playing the M2TS video file most voluminous in size. Our team is working to resolve this issue in particular through alternative of exploring the Blu-ray structure and start playback of the video file with a longuer duration than the film. 1. Using Windows Explorer, explore the Blu-ray folder structure. Note: If you have Windows 10, know that it is no longer necessary to use special software to explore the BDMV folder structure. 2. Open the BDMV folder and the STREAM folder. This folder contains all the Blu-ray video files. 3. Click the Size tab to sort the files by displaying the largest first. In general, it is always the biggest file that matches the film. But you have to check it. 4. 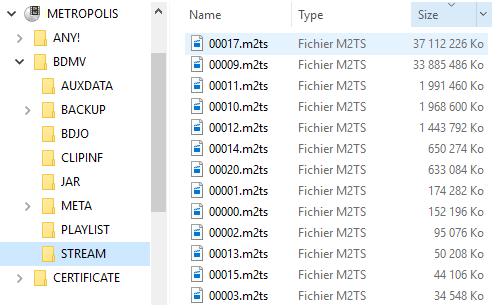 Double-clicking on the biggest M2TS files to start playback. If it is not the movie, check another file. Repeat this operation till you finally find the right file. 5. When you see what is the file that matches the movie, isolate it, rename it with the name of the movie and copy it to your Zappiti MOVIES folder. Then delete the remaining structure of the Blu-ray that no longer contains the movies but only bonuses. Note: M2TS file contains subtitles and all audio tacks but it doesn't contains chapters. But you can use the buttons 1 - 9 to go to 10 - 90% of the movie duration. You can also use the buttons LEFT and RIGHT to jump to 1 min forward or 1 min backward. 1. Using Windows Explorer, explore the Blu-ray folder structure. Note: If you have Windows 10, know that it is no longer necessary to use special software to explore the BDMV folder structure. 3. Click the Size tab to sort the files by displaying the largest first. In general, it is always the biggest file that matches the film. But in the case of the Seamless Branching among the largest files or is the bonus that prevents the movie because their duration is longer than that of the film. To locate them, double-click the biggest video files and then delete them. Normally, removing bonus files that blocks the movie on Blu-ray should get started on the film and not the bonus when it starts playback from the Zappiti Player 4K.